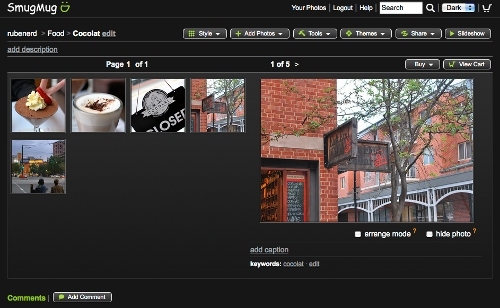 Trying out SmugMug after hearing so many people on The Twitters and other sources rave about it. I've uploaded a few photos from my sister's and my recent trip to Cocolat on Rundle Street in Adelaide. Tastyness! While I do love the design and think their uploading tools and generated URLs are far superior, I think I'll stick with Flickr for now. I've already got a ton of stuff hosted with them from many years of use, they make it easier to display images externally, not to mention the fact I just topped up my pro account so might as well use them for the next year!